Whether you are a first time winemaker or an old hand, one thing will never change — you need yeast to make wine. Simply put, all wine is the by-product of fermentation. Alcoholic fermentation is a biochemical process where yeast consumes sugar and produces alcohol and carbon dioxide. How does yeast get into the must? There are two sources. One, you may supply it by inoculating the must with cultured yeast cells. There are many strains of cultured yeast available on the market that will bring out different characteristics of wine. Choosing a good one for your type of wine takes a bit of research (Check out “The Strain Game” in the Fall 2000 issue). If you make wine from concentrate kits, the yeast is supplied in the add pack for you. The fact is kit wines will not ferment at all unless you add yeast. During processing all living organisms in the grape concentrate have been removed or killed. This brings us to the second source — wild yeast. Many winemakers who make wine from fresh juice or grapes add no yeast at all. If you buy juice, the retailer may suggest you simply take it home and let it sit until it starts fermenting on its own. And within a day or so, it will begin to bubble. How does that happen? Wild yeast is what the name implies. Wild. In other words, it is the naturally existing yeast in the air, on vegetation or blowing around in the air. Wild yeast clings to surfaces in the vineyard, winery and on equipment. Any wild yeast species — whether good or bad for making wine — can end up in your must. What comes, comes. The various species of wild yeast floating around your vineyard may not be the same as someone else’s. When you pick your grapes and let them sit there, eventually they will ferment as the indigenous yeast on the grapes — and whatever indigenous yeast is hanging around your winery — colonizes and begins to consume the natural sugar in the must. In a few days it starts turning into wine. Many winemakers swear by wild yeast fermentation. On the other hand, many swear at it. Making wine with wild yeast has been a source of debate for many because of its unpredictable nature. Should you make your wine from wild yeast or cultured yeast? This article will provide some insight to help you make an informed decision. Note: Sometimes wild yeast is referred to as “natural” yeast. The term natural is rather ambiguous. There is no such thing as artificial or fabricated yeast. All yeast — even cultured yeast — is natural. The difference is whether the fermentation is from “wild” or “inoculated” yeast. The fact is cultured yeasts have only been in the winemaking picture within the last century. For thousands of years previously, all wine was fermented on wild (indigenous) yeast. Some old world wineries in France still ferment high-end wines on the local yeast. The question is, if wine ferments on its own, why do some feel the need to inoculate and some don’t? Before we answer that question, it is necessary to know the mechanics of inoculated fermentation. Actually, yeast inoculation is not really a matter of need. It’s a choice. By far, most (but not all) commercial wineries inoculate. Even the great Bordeaux wineries inoculate. When yeast converts sugar to alcohol, it also produces other compounds and esters that contribute to the aroma and the fruitiness of wine. For red wine, fermentation also contributes to the color extracted from the skins. A favorite wine you buy from the store has a consistently reliable quality because it was inoculated with a cultured strain of yeast isolated for its desirable fermenting characteristics. A specific cultured yeast strain might be able to produce nice fruity aromas, a high level of alcohol, an attractive mouth texture and an ability to ferment in low temperatures or high acid. Some cultured strains are low foaming, or produce sediment that settles quickly. The list goes on. 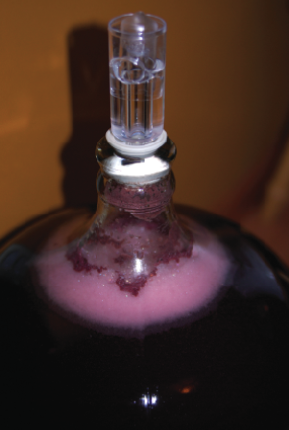 The type of grape fermented will determine the strain of yeast chosen. There are many genera of yeast. Each yeast species may exist as many different strains. In winemaking, one of the most important characteristics of yeast is its ability to completely ferment all the sugar in grape juice and tolerate high levels of alcohol (anywhere from 8–18%). High alcohol (usually 12% or more in wine) gives wine its longevity, body and other positive features. Without good alcohol, wine dies quickly. The species of yeast considered most desirable for total alcoholic fermentation is Saccharomyces cerevisiae. When you inoculate the must of your kit wine, chances are, it is a selected strain of Saccharomyces designed to produce the best results consistently for that concentrate. When you purchase yeast to inoculate your grapes or fresh juice, it will be Saccharomyces. It is the same with most store bought wines. When grapes are harvested in the vineyard, they are covered with a myriad of biological organisms, including yeast. There are thousands of different types of wild yeast. Many do not make good wine. Along with the wild yeast are other spoilage organisms and bacteria. That is why when you buy crushed grapes they are often treated with 30–50 ppm of sulfur dioxide (SO2), to stun or kill wild yeasts and inhibit the growth of spoilage organisms. Then the cultured Saccharomyces cerevisiae yeast is added into the must. When yeast is inoculated into the must, the dose is usually large enough to insure that the yeast fermentation starts rapidly, and that a single strain dominates the entire fermentation so that if other wild strains are present, they cannot get a foothold and produce off flavors or negative characteristics like rotten egg smells. Wines inoculated with Saccharomyces tend to deliver reliable results — and there is the key word: reliability. This brings us back to wild yeast. When making wine with wild yeast, no SO2 is added to the must. The wild yeast is uninhibited or held back from multiplying and beginning to ferment the juice. The wild or indigenous yeast is allowed to do its thing. This is called spontaneous fermentation. The question is, how do you know what yeast is in there? Is it good or bad? Frankly, without a laboratory, there is no way of knowing exactly what yeast is in the must. However, it is possible to have a general idea of what is going on. Before going on, it is only fair to mention a category of yeast that exists in the gray area between wild and cultured yeast. Feral yeast is a term that some have coined to describe yeast that exists specifically in the winery, on winemaking equipment or in the wood grain of barrels, etc. There is no way of determining where this yeast comes from. It could be escaped cells of cultured yeast. It could be wild yeast that blew in from outside or came in on someone’s hands or clothing. It could be a mix of both. Regardless, feral yeast also play a role in spontaneous fermentation. Studies have shown that of all the yeasts in the vineyard, the desirable Saccharomyces cerevisiae is probably only on about one out of every 1,000 berries. In some vineyards, Saccharomyces cerevisiae may not exist on any berries at all. Some argue against these statistics, but results are so inconsistent no one can prove one way or the other. Even so, other indigenous yeasts are also considered wine yeasts. Moreover, there are thousands of other wild yeast strains. This article can’t name or describe them all. However, for winemaking purposes, wild yeasts themselves can be broken down into two subcategories: wine yeast and spoilage yeast. Just because it is yeast, does not mean it is good for wine. On the other hand, if they were all bad humankind would have given up making wine thousands of years ago. And this is where the fickle nature of spontaneous fermentation reveals its true character. Throughout the old world winemaking community (Europe etc. ), there are commercial wineries that have been fermenting on indigenous yeast for generations. Many California wineries are catching on and beginning to practice spontaneous fermentation with favorable results. Hundreds of home winemakers have been happy with it as well. That being said, why such caution? Quite simply, it is the unpredictable nature of spontaneous fermentation that either attracts us as winemakers, or scares us off. One of the most common characteristics of indigenous yeasts — even good ones — is their low resistance to alcohol. Many wild types of yeast are unable to perform once alcohol levels reach 6%. The result is stuck fermentation, flabby wine with a low immune system, and a pile of unwanted residual sugar — to name just a few problems. Another risky feature is the fact that wild yeast exists on grapes in much smaller numbers than a dose of inoculated yeast. Therefore, it takes longer for wild yeast to colonize – up to a week in larger batches – leaving the grapes open to infection from other spoilage organisms and from oxidation. In addition, once fermentation begins, it is longer and slower, and at a lower temperature. A third risky feature is the unpredictable by-product of off-aromas and esters that wild yeast can impart to the wine. So then, why would someone even want spontaneous fermentation? The answer? For pretty much the same reasons mentioned above. The fact that wild yeast takes longer to kick in, allows more skin contact time on grapes. Thus, greater body, depth of character, and color. Bigger fruit. A frequent by-product of wild yeast is its unusual or odd odors and flavors. It has been noted by many that the unpredictable aromas and esters imparted by wild yeast is what can add to its complexity, giving it an interesting, sophisticated nature. No two batches of spontaneous fermentation taste the same, even when grapes are from the same vineyard, fermented side by side. When wild yeast begins to ferment, it often begins to shut down at 3 or 4% alcohol. By this time most wild yeasts have done everything they are going to do — whether you like it or not. However, during this initial fermentation phase, any Saccharomyces cerevisiae that are present in the must will have colonized to such numbers that by the end of 3 or 4 days their huge populations dominate the wine. There can (but no guarantees) be up to 16 or more strains of Saccharomyces cerevisiae colonizing in the wine by this time. As the wild yeast die off, the dominant Saccharomyces cerevisiae should start to take over, completing fermentation to dryness and a higher alcohol. The result of a sequential fermentation is a wine with complex flavors, fruit and aromas, with good alcohol. Clearly, the very features that can work against spontaneous fermentation are the same features that work for it. This is the main reason why spontaneous fermentation is practiced in winemaking. Many winemakers believe that there are qualities that wild yeast imparts to wine that cannot be achieved with cultured yeast. The big question is, which characteristics will prevail? The complex flavors or the off odors? What if there is no S. cerevisiae in the must? What if the whole thing shuts down at 6%? That brings us back to the initial question — to inoculate or not. Experienced winemakers allow spontaneous fermentation to begin while watching the must carefully, taking regular readings of the amount of sugar or specific gravity of the must, to determine the current alcohol. After they estimate that the alcohol has reached 3 or 4%, they may sometimes choose to inoculate with S. cerevisiae to ensure complete fermentation. They get the best of both worlds: complexity of wild yeast, and sound full-bodied wine. While no one can predict results with spontaneous fermentation, there are certain features you can watch for to help you determine if you want to take that walk on the wild side. Although it is not possible to know what types of yeast are on your grapes, or in your must, sometimes the very condition of the grapes or must itself will help you predict the odds. pH and acid in grapes are important enough even when inoculating with cultured yeast. Grapes picked with a low pH and good acid possess inhibitory qualities that stifle spoilage during the lag phase it takes for spontaneous fermentation to kick in. During the lag phase, the must is vulnerable to bacterial growth and VA (volatile acidity) from acetobacter and lactobacillus. These bacteria can produce very unpleasant aromas in the wine and literally turn it to vinegar. If you grow your own grapes, you will probably have a good idea of your grape pH and acid. If your grapes are being shipped in, find out what the pH and acid is before deciding whether to inoculate. If you are picking up your grapes at a local vineyard, ask the merchant. Note that some vineyards will automatically crush your grapes and shock the must with sulfur to inhibit spoilage and spontaneous fermentation. For spontaneous fermentation, avoid sulfur in the must. If rain fell just before harvest, yeast may have washed off and yeast cell populations will be severely reduced or limited to what arrives on winery equipment. In the mean time, lingering water and moisture on the grapes also promotes rot. Bacteria in the must will multiply during the lag phase while what little indigenous yeast is present is trying to colonize. There may be no Saccharomyces cerevisiae in the must at all. If you do allow for spontaneous fermentation anyways, you might want to consider inoculating with cultured yeast at 3 or 4% alcohol. As a security measure, you may even choose to take your total batch of grapes or must, and inoculate some, while allowing another portion spontaneous fermentation. After all fermentation is complete, you can blend wild fermented wine with culture fermented wine, to give your finished product complexity. In the event that the spontaneous fermentation goes wrong, not all is lost. You still have a large portion of good wine finished on cultured yeast. Many California wineries practice blending wild with cultured with favorable results. After reading all of the above, the original question may still lurk: why is it that some old-world (i.e. Burgundy) wineries have been successfully fermenting great wine on indigenous yeast for hundreds of years? The answer to the question is in the question itself. It is because they have been doing it for hundreds of years. And…dare I say it…some do inoculate with wild yeast. Over decades of growing and fermenting (often the same grape), and dumping the old pomace and yeast sludge back into the vineyard, an accumulative buildup of particular yeast strains tend to dominate the region. They blow in the wind, cling to the winery walls, stick to equipment, on hands and feet and clothing and lodge themselves in the wood grain of barrels. The grapes themselves are covered with the same dominant micro-flora year after year. Decade after decade. Century after century. The result is every harvest spontaneously ferments the grapes with the same “native” strain(s) of yeast. No inoculation is necessary. The entire appellation has been permanently inoculated over generations. Unless your vineyard and winery has that consistency of wild yeast that has built up over generations, chances are your wine will not have the same reliable results. Even so, even in Old World wineries, nothing is left to chance. Old-world winemakers have learned that letting a pile of grapes sit there until they start fermenting is still high risk — regardless of the established micro-flora. To ensure that fermentation begins, some wineries pick a small portion of their grapes a week before the harvest. At this point, the pre-harvest grapes may still be acidic. If so, water is sometimes added, and the must is stirred and aerated to stimulate the wild yeast and get it fermenting. After several days, the pre-harvest grapes will be fermenting vigorously as a yeast starter. This starter culture is used to inoculate the harvested grapes as they come in from the field. The result? Must inoculated with wild yeast: Pied de Cuve. Clever. Having said all the above, it is easy to understand the old adage: wine is made in the vineyard. Needless to say, successful winemaking with wild yeast might be spontaneous, but should not be haphazard. Spontaneous fermentation is not the lazy way. In fact, making good wine with wild yeast takes greater care and attention than inoculated fermentation. A savvy winemaker will be monitoring the fermenting wine at all times, checking odors, temperatures and alcohol. Wine will ferment itself, with or without you. However, making good wine with wild yeast takes a watchful eye and informed decision making.